This indoor area rug is hand loomed and has a low pile for easy vacuuming. This traditional silk on silk rug has multi natural colors in a random way to allow it to blend easily with any decor. It is a highly durable rug due to pure silk material. The traditional Persian Moori Handknotted Area Rug has been transformed into the fresh interpretations of artistic patterns through our collection of Kashmir pure silk rugs. Earthy tones and traditional oriental design has made this handmade rug from India outstanding. Attractive color combinations and captivating designs are the other catchy features of this silk rug. 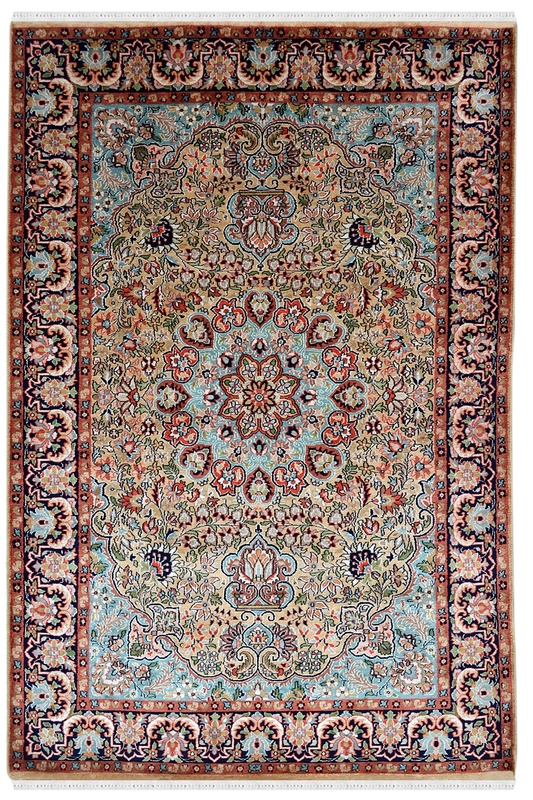 It contains a circular design in the center and ground of carpet is filled with tiny floral motifs.